It is also not unusual at some point in this process for some image to slip out that reveals an inexplicable sense of woundedness or feelings that we are somehow bad. This may be due to early life experiences, or it can even be tapping into collective beliefs as well. Regardless, it is important for our healing to be able to allow them to come through and to look upon them with compassionate curiosity. In many cultures we are also taught that our bodies are something we should be ashamed of, especially as women and girls. We are taught to cover them up and aspire to some celebrity ideal that is unattainable for most of us. This process offers a chance to work with these beliefs and help them to heal, for ourselves and for the collective. It can be very useful to explore creating "self portraits", whatever that might mean to you. At a time when I was experiencing injury to my arms that resulted in numbness in my hands I made many journal images where I traced my hands and colored them in. These were self portraits that helped me to process what was happening to me. 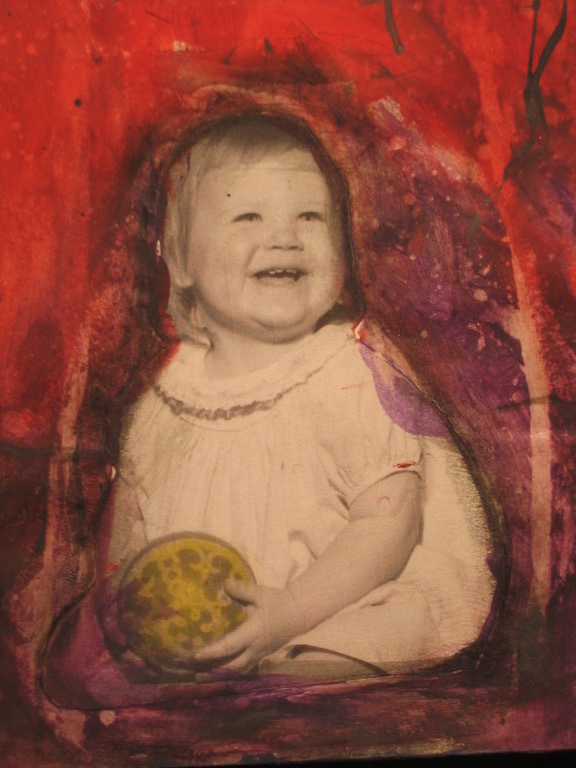 At other times I have collaged copies of old photos of myself and then painted into and over them. Often times it helped me to work with unresolved feelings from my early life or issues I have had with my self identity. So it can be powerful to integrate images of yourself into your Creative Inquiry process. If a disturbing image comes up it is especially important to be gentle with yourself and to watch how you respond to it. It can be particularly helpful to use your page of spontaneous writing to allow the image itself to do the speaking. Sometimes what is wanting to come through has never been heard and just giving it voice can contribute a great deal to our growth and healing. So try writing as if it is your picture talking and see what it has to say.